The opening page. Prince is back in Minneapolis! Alert the citizenry! 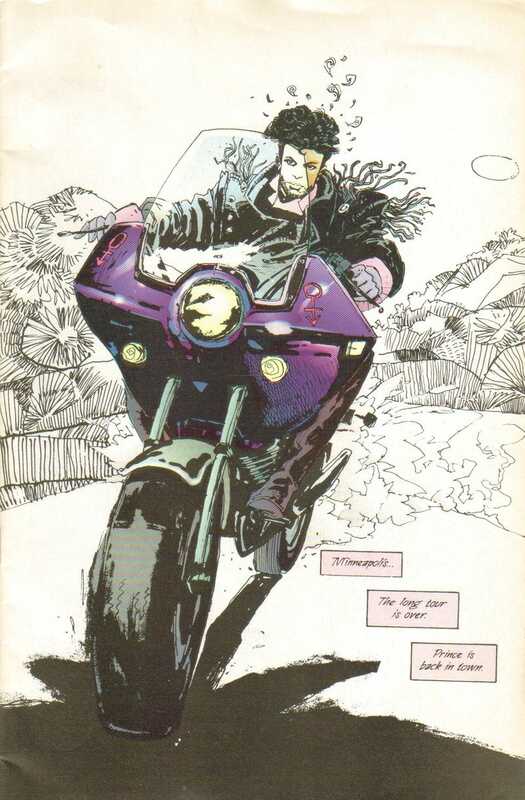 Prince rides a purple motorcycle, which later gets blown up after a dramatic motorcycle chase sequence with Gemini. There is music in Minneapolis, and only Prince can hear it. Is that Lake Minnetonka? You probably have to take your clothes off before Prince will tell you. One of several sequences where Prince stops the gang-bangers of Minneapolis from hurting each other. In this instance, he has to resort to violence, using his Prince-fu. Prince senses a disturbance in the Force — some powerful musical entity is creating a "brilliantly chaotic" sound that starts to drive people over the edge. Here's how we learn about Gemini being the Joker to Prince's Batman. Also, "Twin Cities. Twin Men." Does that mean Gemini is from St. Paul? Towards the end of the comic, Prince confronts Gemini one last time — and Gemini has a last surprise: a death-trap guitar, rigged to electrocute Prince if he tries to play it. But Prince's girlfriend Muse (who was secretly working for Gemini and now feels bad about it) throws herself on the guitar and saves him. A tiny selection from the climactic "rock-off" sequence.